This module helps user to print State-Wise Sales Register. This add-on facilitates the user to Create City & Area Master which can be selected in Ledger Master. 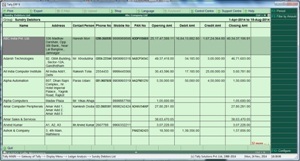 User can print Bills Receivable outstanding Report based on City & Area Selected. This add-on facilitates the user to track Salesman wise various Reports. This module enable user to maintain Sales man wise Sales / Purchase Report, Ledger wise salesman report, Outstanding Report. This module gives user a freedom to give any kind of reference to bills so that he can filter the bills outstanding report as per his choice. This module is useful to print the required details at the time of Income Tax Assessment of the Company. User can filter the report amount wise by Pressing F3. 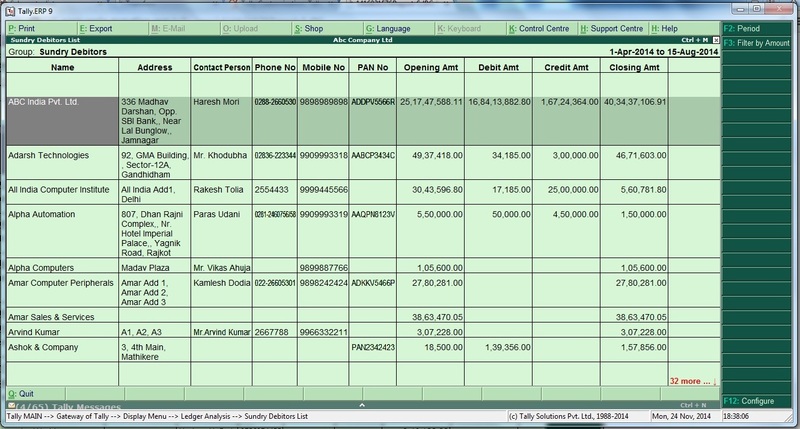 This Module facilitates user to print Credit Days in Outstanding Report.This module will work for Bills Receivables as well as Bills Payable Report. Credit Days will be printed in Bill wise report and Bill Party wise Report also.